Most of the family are unable to let go of the house and beloved cherry orchard. Having no change management strategy in place, they cannot project themselves into the future. Lyubov, Gayev, Lyubov’s teen Anya (Keshia Palm), and housekeeper Varya (Tara Nicodemo) have an attachment to the family home that is palpable and ridiculous, and it is even expressed at one point with an ode to a bookshelf. The acting in The Cherry Orchard is all-round superb. Khanjian aptly portrays paralysis in the face of change, loss of status, as well as grief over her deceased son. Andrew Scorer, who plays the elderly servant Firs, is a mumbling mess who frets about whether his master is wearing a proper coat. He has us wrapped around his little finger, making us laugh and ultimately cry. Sound designer Thomas Ryder Payne makes The Cherry Orchard very interesting to listen to. The moment the family and their entourage finally bid farewell to the beloved home is particularly striking. The sound of footsteps, drawers opening and closing, doors shutting and being locked and so on were powerful and sad. There was no sense of energy or a new beginning, only the sound of departure. 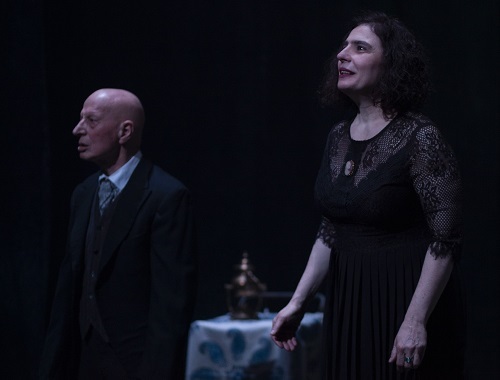 As for the set by Trevor Schwellnus, the story takes place on a simple black stage with little furniture, whose backdrop is like a night sky, illuminated by several little lights. Also, we never see a single cherry tree. Even though the family talks as if clearing the orchard is akin to murder, not a branch is in sight. The cherry trees are alive via the family’s nostalgia, as well as the sounds of birds chirping among the trees at the beginning of the play, and the sound of the axe falling towards the end. The Cherry Orchard is 113 minutes long (courteously marked on a sign) and there is no intermission to allow us to stretch our legs. I also personally found the theatre program to be confusing. I don’t think the names in the program always matched the names on stage. I heard distinct cries of “Where is Leonid?” and “Has Leonid sold the estate?” yet this character is called only Gayev in the program. Shouldn’t the names we hear correspond to the names we read?